During those long winter nights along with fly tying I like to dig out some maps and take a look at some thin blue lines. Some of these are marked on the maps and hopefully they will be productive streams. Over the last few weeks I have done some recon on a couple of these streams and found one to be a good looking prospect. Well yesterday I took the TFO 2wt and did a little bushwhacking. 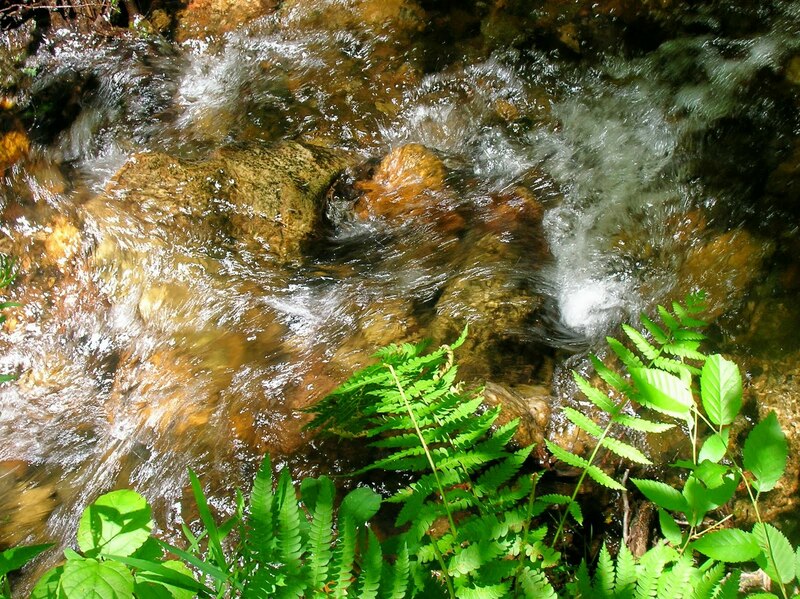 The stream was a little freestone that had it share of deep pools, and swift runs. In places it was thick and brushy, and in some places it opened up into a forest of large hemlocks, and hardwoods. The wild trout that inhabit these streams are not fussy as to whats presented to eat. But they are especially cautious, and a branch that's set in motion over the stream will put them down deep, and they will be reluctant to take a fly. One of the things I always do when fishing is to take the water temps. This will tell me to fish or to walk away. I will not fish waters with a temp above 65 degrees. This stream was a cool 58 to 60 degrees. When I removed my thermometer from the water I noticed a hitch hiker....... Natural trout food. 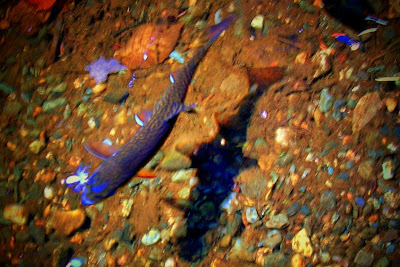 Deep dark tanic waters produce colorful wild jewels. As I left this thin blue line, I was tired, sweaty, had a sore knee, and was mosquito bitten. And I love it. This is the last gate on the road that leads to the Upper Dam pool in Maine. Upper Dam is between Mooselookmeguntic and Richardson Lakes. 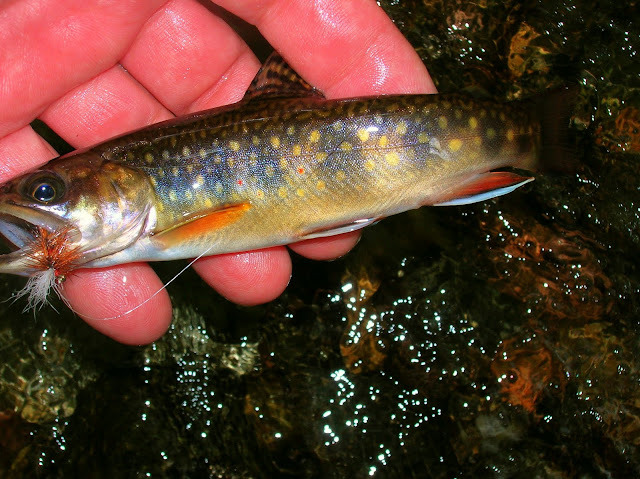 Its waters are home to some of the large brook trout and salmon the State of Maine is known for. It also has the claim to some of the greatest streamer fly patterns ever created. The road is gated so as to limit vehicle traffic in the lower areas for the camp owners. I have walked this road many times over the years. A beautiful walk through some spectacular wilderness. Moose, black bear, whitetail deer, fox, can be seen on most days. 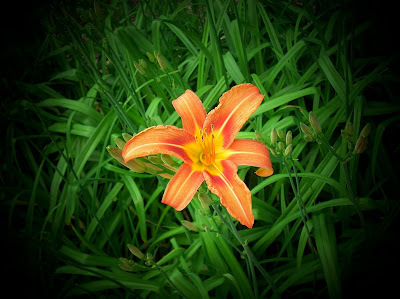 The smell of balsam can be intoxicating. Just before reaching the dam there are a series of four or five old camps. These have been here probably since the early 20th century. The camps have names such as "Stagger Inn", "One Horn" etc. But one camp always stood out from the others. 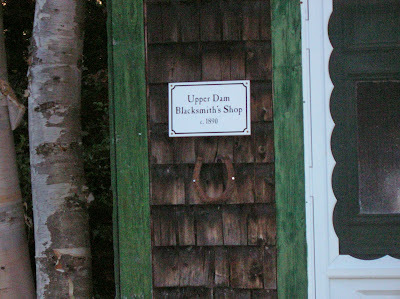 "Upper Dam Blacksmith's Shop". I don't know if it actually was a working blacksmiths shop or where a blacksmith lived. I don't know why I never asked how the name was given to the camp, but it was the name I have chosen for the first streamer in this post. 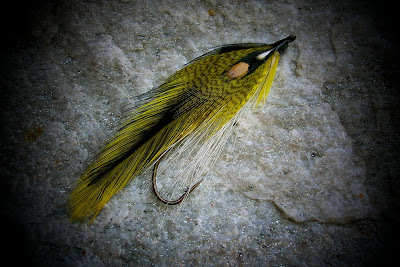 While sitting at my desk the other day, I looked at a bright yellow saddle laying on a book of Fran Betters fly patterns. A few thoughts went through my head, a good looking streamer can come from this. While Fran is not noted for his streamers, his other patterns are well known. So with a few more ingredients thrown into the mix I created this streamer. 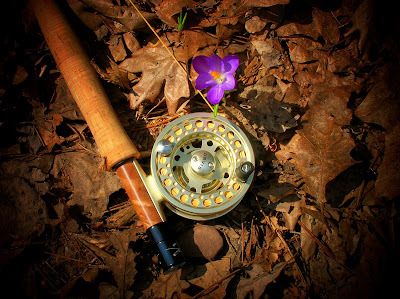 While the ultimate goal of our picking up a fly rod and heading to a stream may be the catching of a fish, but there is so much more. These ferns on a misty drizzly morning seem to be opening up there arms as if to say welcome. This is a variation of one of the best attractor patterns for small stream wild trout, especially brookies. 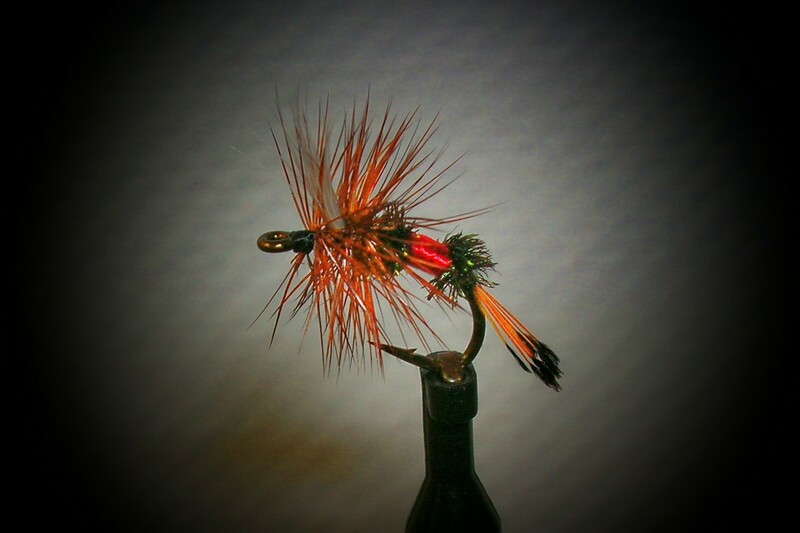 The original pattern, Royal Coachman, probably gos back to England. 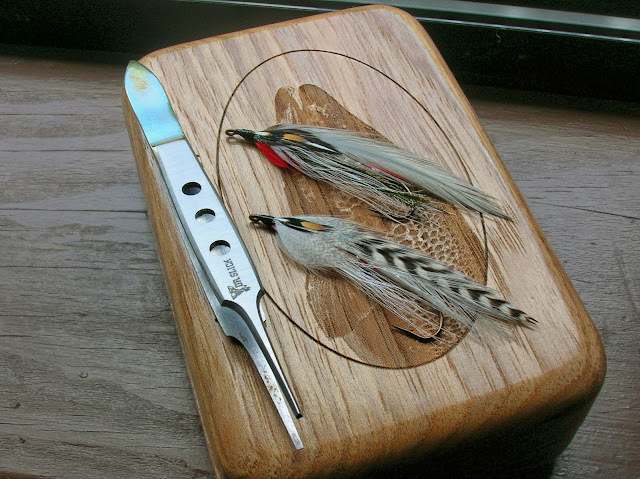 Lee Wulff created a version he called the Royal Wulff, using hair for the wing and using the fly for trout and Atlantic salmon. This is my version, "Royal Wulff Emerger"
A fish eye view of the "Royal Wulff Emerger"
A small stream on a morning when a light rain is falling. 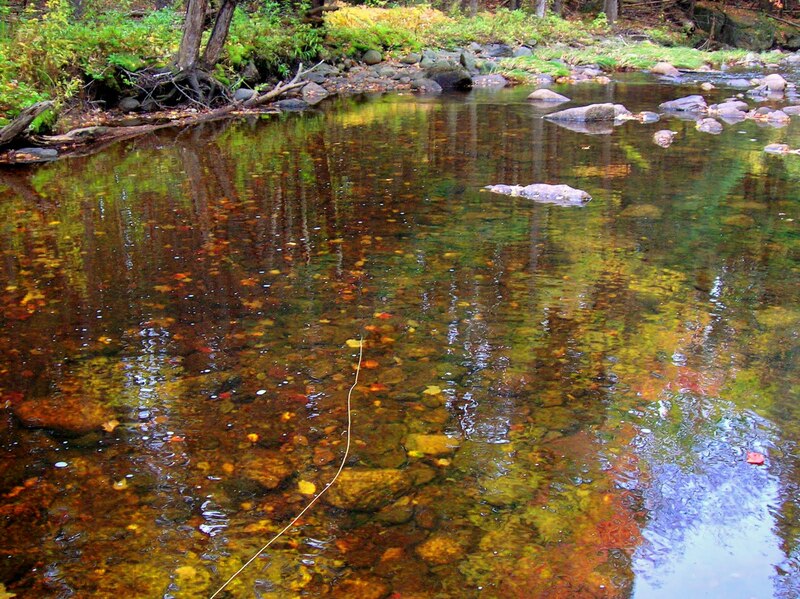 These times are so peaceful to the angler....... the trout will also loose some of their caution. Perhaps that's why some of the best of days fishing are on wet days. Some info, Connecticut has 286 streams that support notable populations of wild trout. Pretty good for such a small state. Something to take comfort in, "Egg Drop Soup" it's so soothing, and one of my favorite soups.......... simple, chicken broth, eggs, rice, and Chinese crackers. This post is a few words about a book, and the home of my friends. 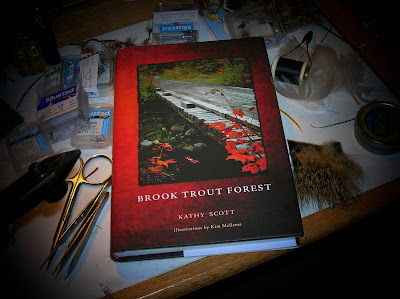 The book is titled Brook Trout Forest, and is written by Kathy Scott. 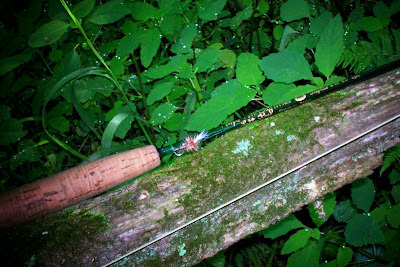 It is a well written book and tells of bamboo rods,the teaching of children the finer points of trout, salmon and the beauty of the outdoors. She mentions fishing for brook trout in Maine, and other states, as well as Canada. If you have the opportunity to read it do so. You will truly enjoy it. 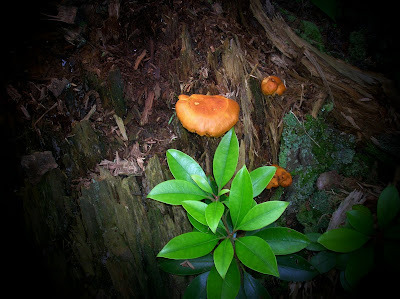 A few words about my wild friends. As the book speaks of the Brook Trout Forest, below are some of the wonderful wild places they inhabit. Although the brook trout has been pushed back into smaller headwater streams, they take no backseat to beauty. 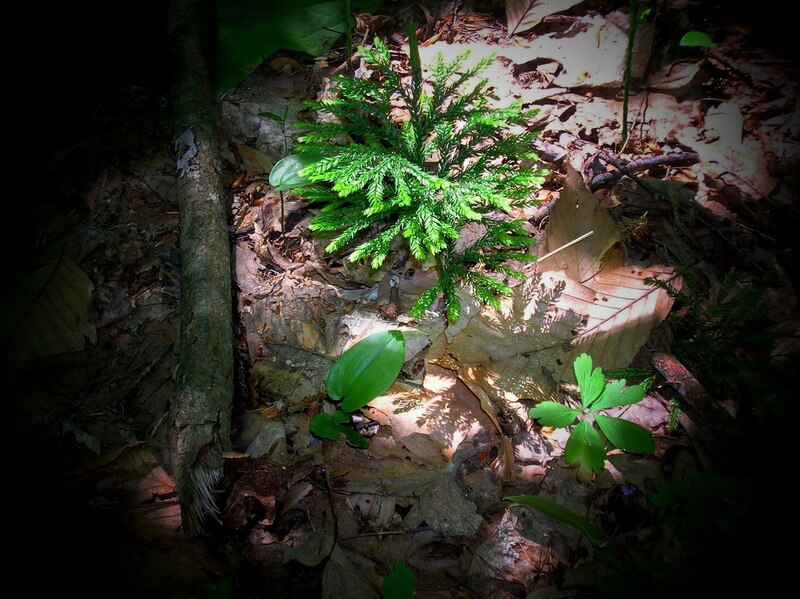 They live with the fern, hemlock, maple, with the tiger lily, the mushroom, salamander, snake, and the countless wild animals who live there alongside the brook trout. 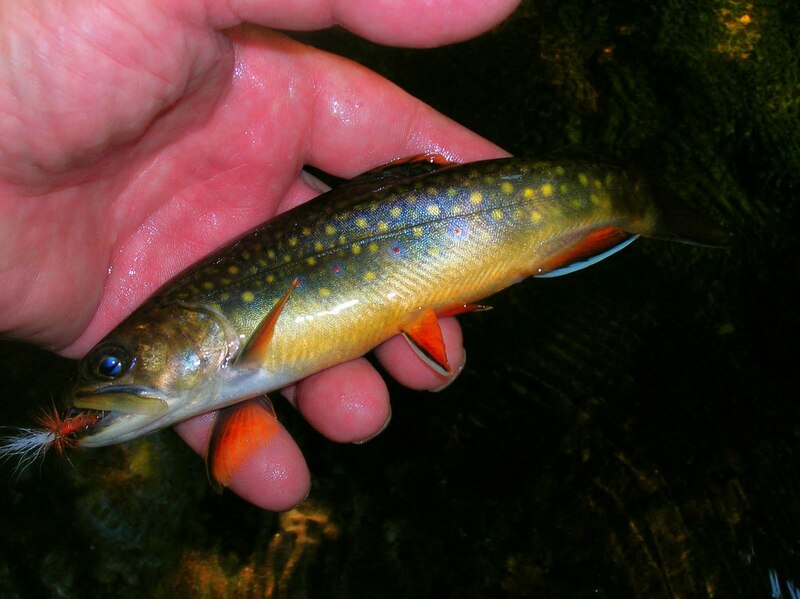 I have pursued the brook trout for years, and never grow tired of him, nor the beauty of the environment he dwells in. 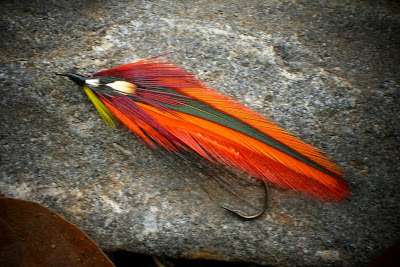 I've given this streamer the name of "Tanic", It's colors represent the tea looking colors found in the small streams of the northeast. This streamer is named for a man who hails from Rangeley, Maine. I first made contact with him on a fly tying forum a few years ago, then in person at his work place at Saddleback Mountain in Rangeley. 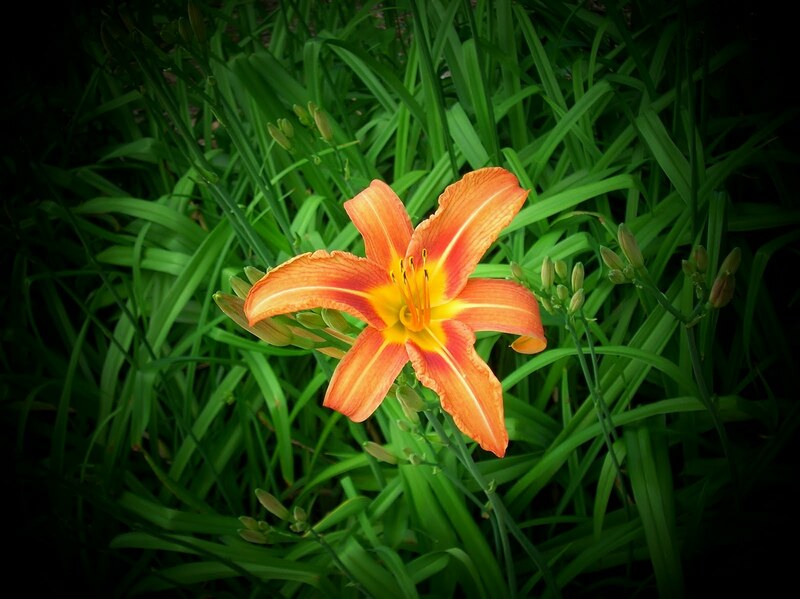 The Quimby name is well known in the history of Rangeley, Manie. 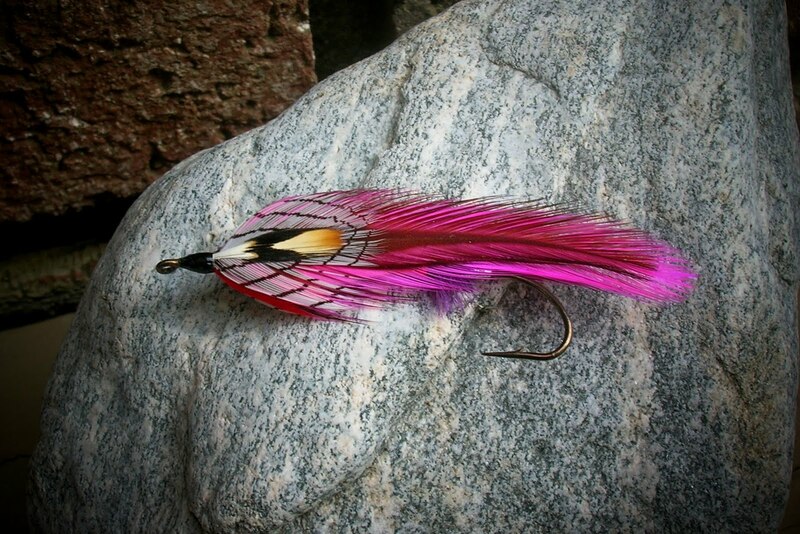 Jim is also a streamer fly tyer. 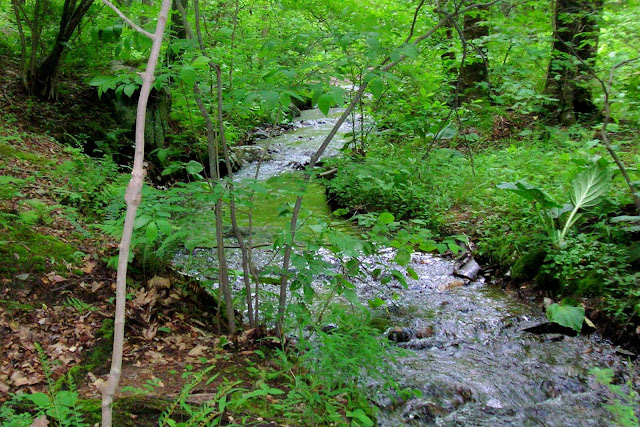 So far this year we in the northeast, especially Connecticut, have been blessed with enough rainfall to keep our streams fresh and free flowing. This is a big improvement over last year when a lack of rain was almost a disaster. The stream I fished the other day is one of the ones that had a rough go of it last year, but from the photos of it now it appears to be in wonderful shape. It also fished very well. The stream is a typical mountain freestone, with lots of color. 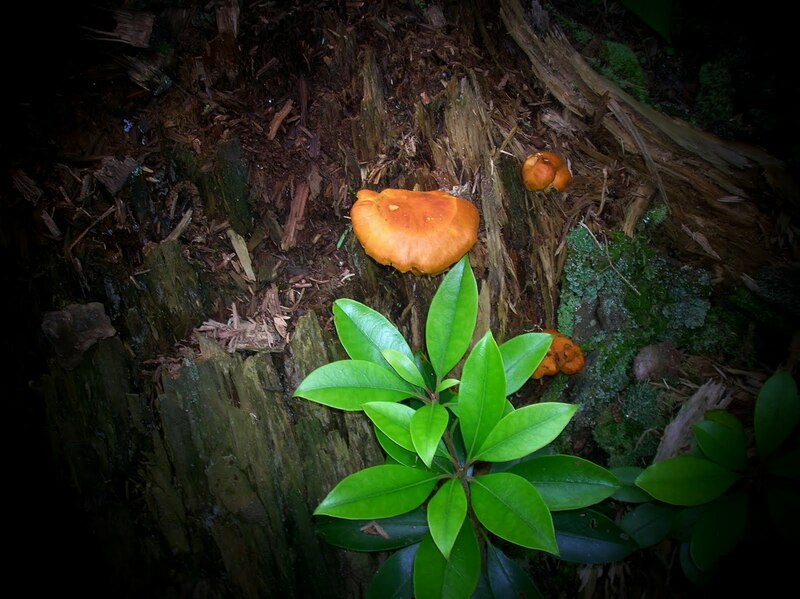 It's surrounded by large hemlocks, and hardwoods. Just sitting by its waters you can hear natures concert, with the birds at full voice. 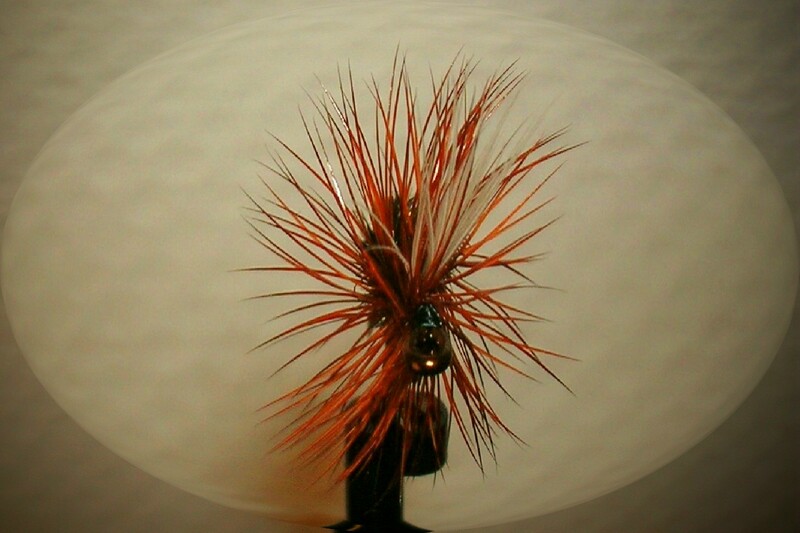 This little Emerger/Dry fly has been producing very well. It's a generic pattern that's not to hard to tie. 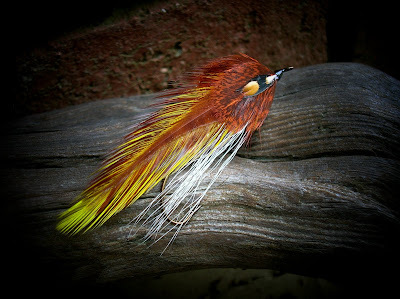 I'll vary the body color, and hackle, to produce a variety of stream bugs. This little beaver pond, thats not active, and in need of repair, gave up some wonderful little brookies in the 4 to 6 inch size. I would have fished this spot a while, only the mosquitos were on a feeding frenzy. This wild gem was a surprise. He almost looked to big to be in the stream. He also came back for the fly three times, before coming to hand. When I released him into the water, I said thanks. 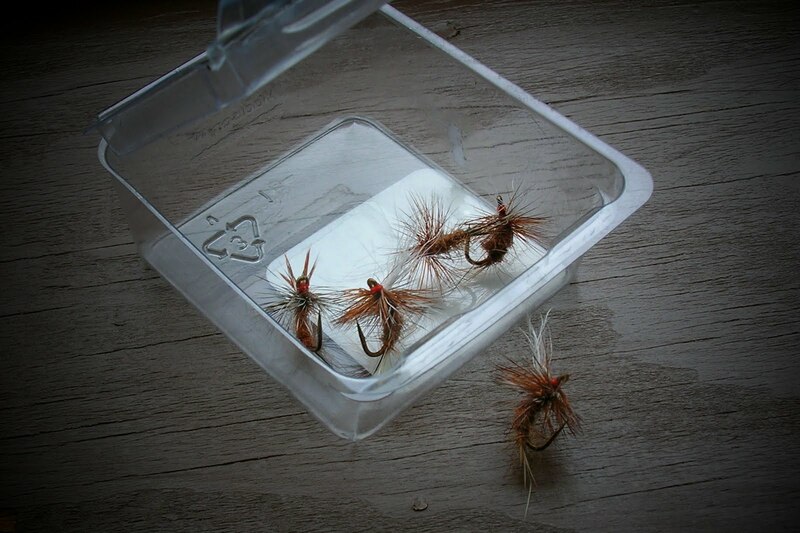 These are a few emerger/dry flies. 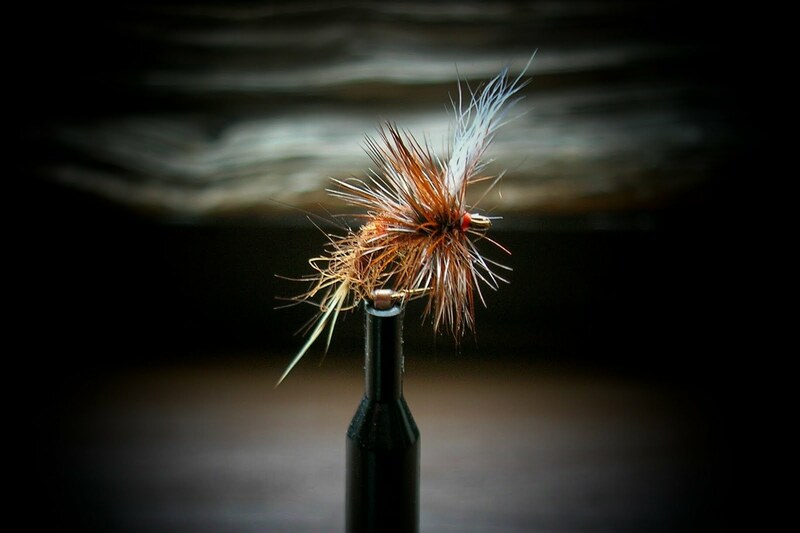 They work well on the small streams I fish. At this time of year fishing pretty much takes up my time. 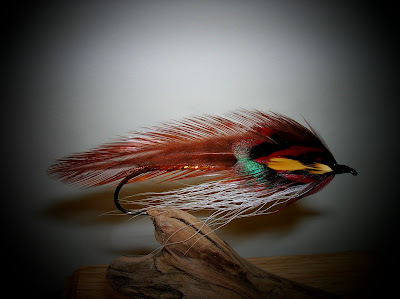 With much more pleasant weather and trout being more the feeding mood, the fly tying can take a backseat. But there are times when I'll take a few hours to crank one or two out. Two streamers that are general representations of baitfish found in most waters. 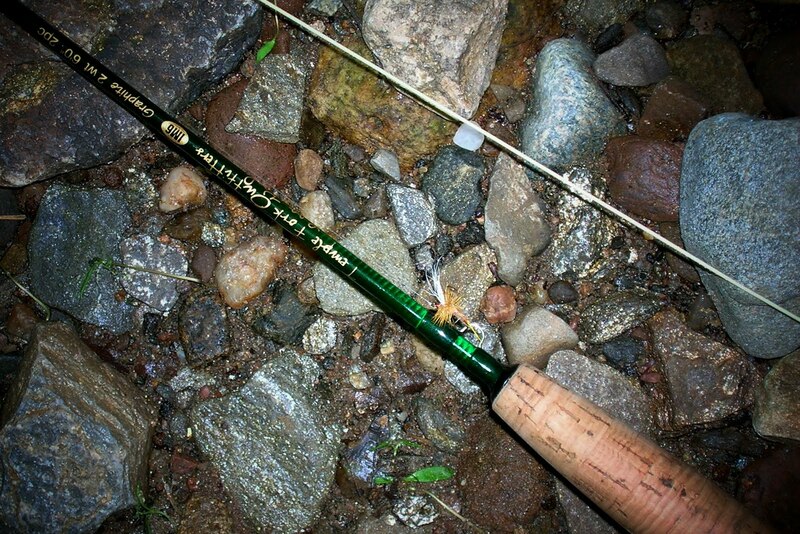 They can be effective for various fish, from trout to bass. 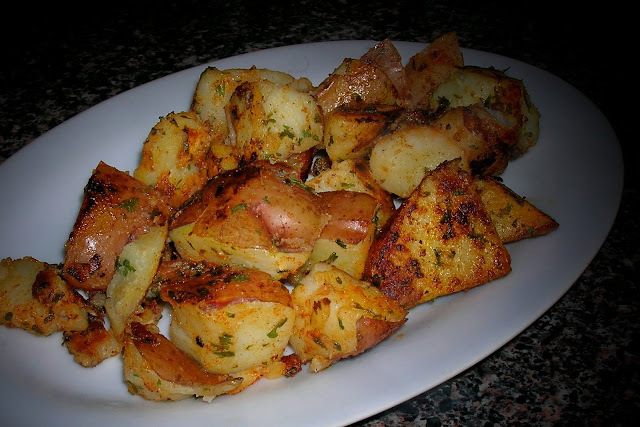 Home fried potatoes. A favorite. Red skinned potatos, cut in various sizes, so as to have some of those small crunchy ones, fried in a skillet and enjoyed at any time of day. Breakfast, lunch, supper, or while listening to Boston's Josh Beckett pitching a one hit complete game shutout. An oddity or two that I've seen along some of the waters I fish. While these stones are not odd, but where they were found was. For the life of me, I can't understand how this tree accomplished this. 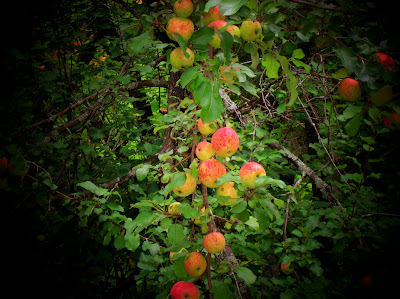 Clarity, wild apples on a tree alongside a stream. Clarity in the reflection on a deep water lake. 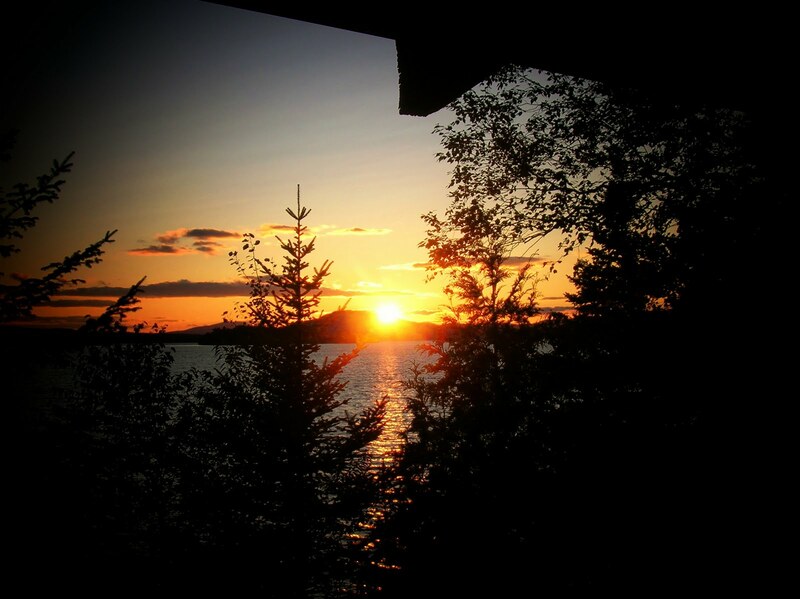 A beautiful sunset, a simple doing that takes place. Today as the sun sets, reflect on your last two fishing outings, Simplify..... Clarity. As I sit here and try to write this post, a cup of coffee, Green Mountain "Nantucket" blend along side me, waiting for the caffien to kick in and give me the clarity to remember the details of yesterdays trip to a stream I love. Jeanette and I had planned to take the day and spend it at Bluff Point Coastal Preserve. But for a reason I don't know the trip was canceled for a reason I can't remember, The caffien is not working yet. Well being one who had a few hours of free time I headed for the stream. The sky was a bit sunny and a bit cloudy with a touch of humidity. Taking the water temp, the thermometer showed it to be 62 degrees. This time of year the dry fly is #1, and I fish it almost entirely. I tied on a Ausable Klinkhammer and let it work. 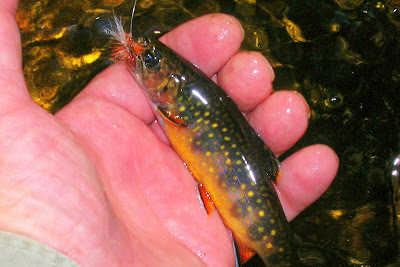 It wasen't long before I was into some action, and a brook trout came to hand. 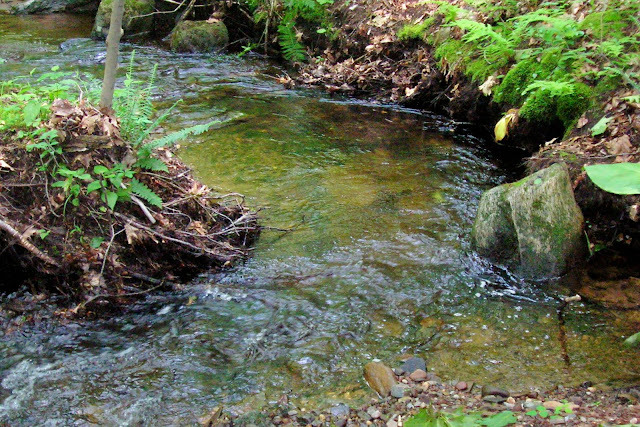 There were many short strikes today, I believe this is happening because the trout are taking up some positions in the stream where the water is moving rapidily and when the rise occurs it can be missed by the trout. 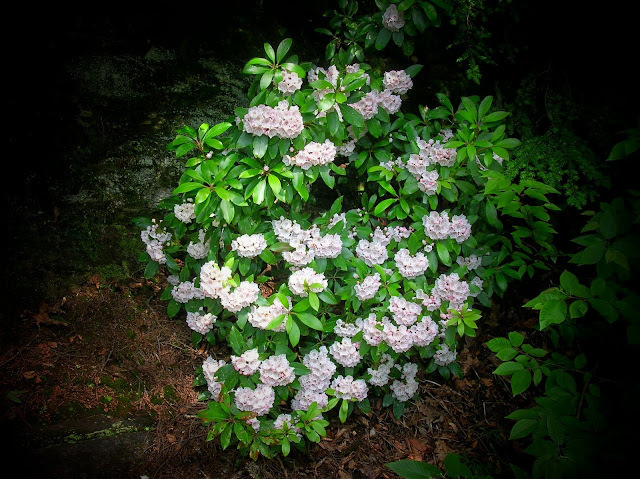 The Mountain Laurel is in bloom and is a beautiful sight along the streams. 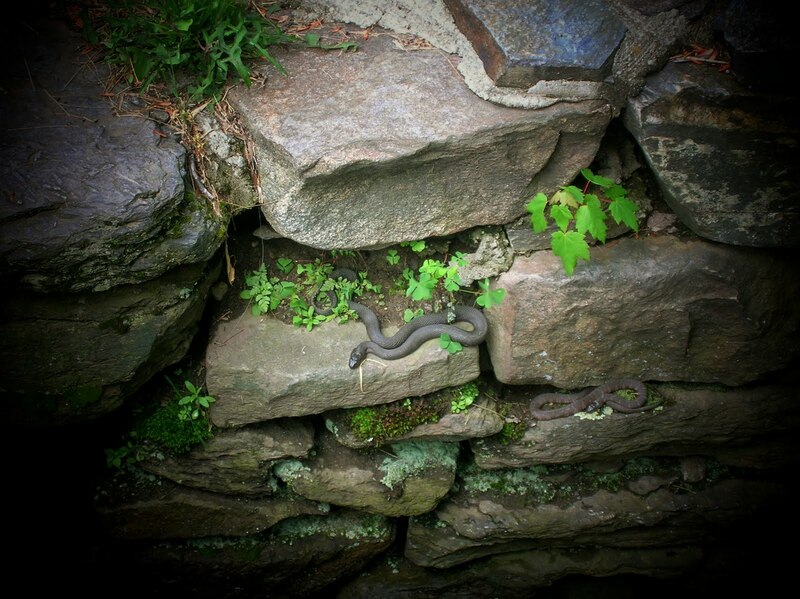 I do see from time to time snakes, in the water, and along the stream, laying on the rocks. Most of the time they appear to be of the same. I noticed these two, and there seems to be a difference. I'm not an authority on these guys, perhaps Jay at "The Naturalist's Angle" can give us an answer. I'm going downstairs for another cup of coffee. I hope you enjoy this post. 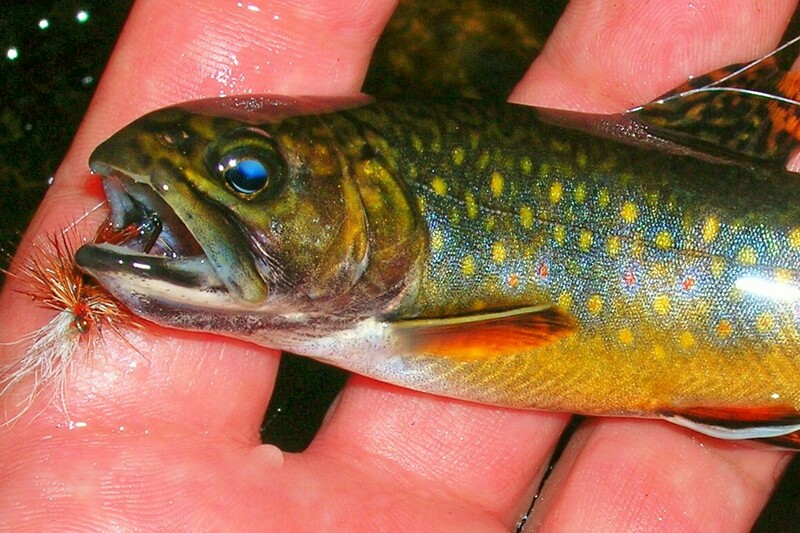 The brookies were holding in positions like this. Either in front of, behind or alongside this rock. They would not take the fly in the smooth water to the left. Wild beauty, comparable to the Mountain Laurel. As I post this I feel as if I'm standing in the Magalloway River in Maine, just downstream from the bridge that spans this river and carries the traffic on Rt16. 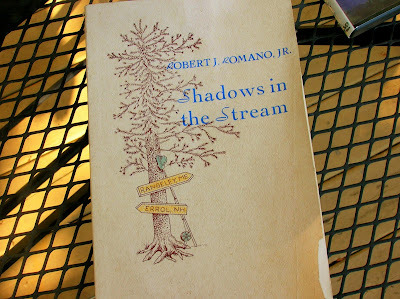 The book above was written by an angler from New Jersey, Bob Romano. 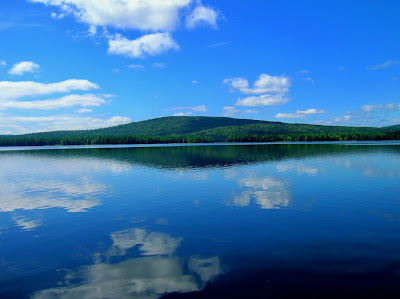 He is a camp owner on Aziscohos Lake, in the western Maine mountains. In his writings he tells of the many places he has fished along Rt16 from Rangeley Maine to Errol New Hampshire. Many of his experiences are well written and will put you there, fly fishing for wild brook trout and landlocked salmon. I have fished these places he writes of, and they are wonderful wilderness waters. Several years ago while fishing a small stream that feeds one of the larger lakes, I had the pleasure of meeting Bob. We chatted briefly, and he moved downstream and I up. Later as my wife and I were about to leave, we were to meet Bobs wife, and his father in law. 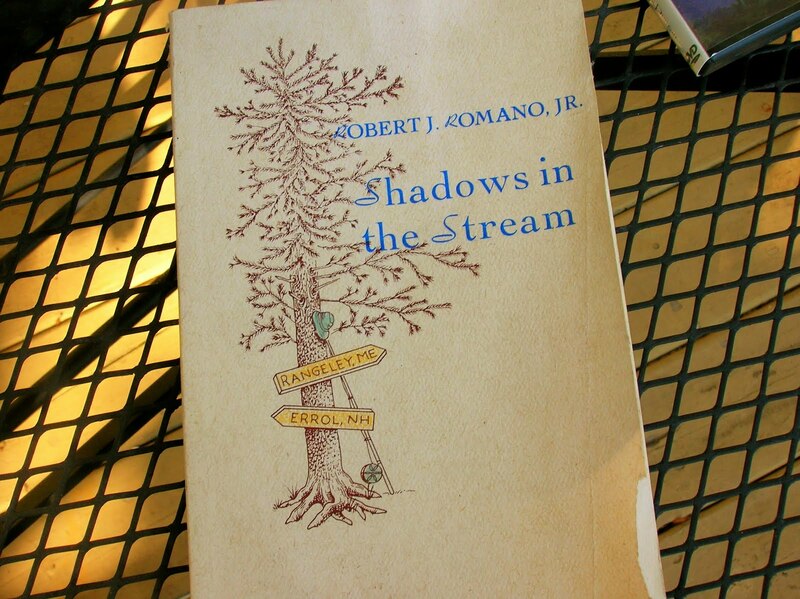 Shadows in the Stream is a good, easy to read, and informative book. Pick up a copy I'm sure you'll enjoy.it.